Are you making these branding mistakes? Small business or large – you need a memorable brand. 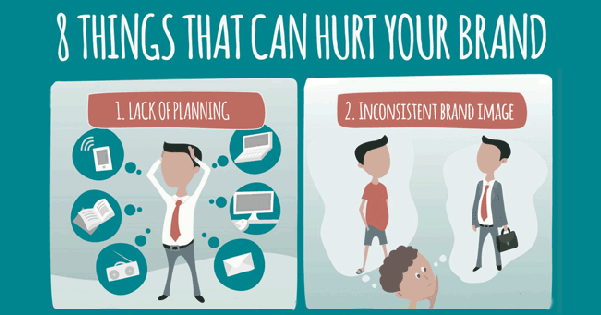 You’ve either worked hard to create one, or are in the process of it, so avoid the brand-killers on this infographic! Check the branding mistakes infographic from Visualistan by Creatage for fun illustrations of these errors you don’t want to make! Not listening to your audience. Badly designed and hard to navigate website. Crossing line between different and offensive. Fess up! Are you making any of these branding mistakes? Louise, your tips are always so practical and helpful! Thank you a ton! I’m pretty new to social media, so I have a million questions. But regarding #2 above when it comes to creating pins for Pinterest: I’ve resisted putting a tiny version of my actual logo on some pins for fear that that takes away from the beauty of the main image. How important is it to be consistent with the logo, or is it enough to simply put my website name in a creative font as a watermark ? It’s really a matter of opinion. I’ll give you mine! If you put a logo on it, people may be less likely to pin and share. The bigger and more obvious it is, the less shares, is my guess. I haven’t tried it. I think what’s more useful is to put your URL on it, anyway. How many people are going to recognize your logo? But if your graphic gets shared far and wide, people will always know how to find you if your URL is on it. Yeah well @Louise that was really a bang over branding mistakes!! So do I believe in stuffs like planning things before hand works out to be good with any stuffs but it should be off a customizable one so that we could modify it when something goes wrong and even we could throw it off when we feel sick with the plan that we choose!! Being able to shift gears when things aren’t working is always a good idea! Thanks for your comment, Parker. Regarding #1. For a start up small web based retail business do you think many are guilty of to much planning? ex. paralyses by analysis trap that results in delay. Any tips on best ways to get a good pulse on the effectiveness of early branding efforts so you can make timely adjustments if needed? To see if your branding is effective, you could ask a trusted colleague, or even your customers, how they “read” your brand. Then you can see if that jives with what you’re trying to portray.